Sole March 2017 for £110,000. Charles John Robson was born on 7 January 1855, in the Parish of St George’s, London. He enlisted into the Royal Engineers at Bow Street Police Court, Westminster on 30 April 1873, aged 18 years 6 months, a groom by trade. He was sent to Aldershot and posted to “B” troop (Equipment) R.E. Train. Lieutenant John Chard joined this company on 18 April 1876, and Robson was detailed as his batman and groom. They were still in Aldershot in December 1877 when the majority of the drivers, including Robson, were transferred to 5th Company which was forming a mounted engineers detachment. On 2 December 1878, he accompanied the 5th Company as they boarded the S.S. Walmer Castle bound for active service in South Africa. Arriving in Durban on 4 January 1879, they were greeted by a torrential downpour through which they had to unload hundreds of tons of stores and equipment. Lieutenant Chard, with Driver Robson, a corporal and three sappers, were ordered to Rorke’s Drift post to repair the pontoon bridge across the Buffalo River. A small mule train was organised on which the men and their equipment were loaded. Chard rode on horseback with Robson on his spare mount. Chard and his men finally arrived and set up camp on the Natal side of the river on the 19th. They then set to work on one of the ponts, the other still at full stretch with the wagons of the centre column. The damaged pont was repaired and in use by the evening of the 21st. Unfortunately there would be no respite for the corporal and three sappers; having endured the long slog up from Durban, they now received orders to join the centre column next day at their new camp at the foot of Isandhlwana, some ten miles up the road from Rorke’s Drift. On the morning of the 22nd the four men climbed into their empty wagon and, with their native driver, set off for Isandhlwana, where, later that day, they met their fate together with some 1350 officers and men of Lord Chelmsford’s column in the greatest disaster ever to befall the British army. Chard had also been at Isandhlwana that morning to obtain his own orders but left just before the main force of Zulus appeared and arrived back at Rorke’s Drift in time for lunch, which Robson had prepared for him. He then settled down to write some letters home. The peace and quiet was soon shattered by the arrival of several riders who had just escaped from Isandhlwana. They brought news of the disaster and of a large Zulu impi now racing towards the mission station. Orders were hurriedly given and Robson saddled the two horses and started up the hill, the native driver following close behind with the wagon, which he left near to a rough stone cattle kraal not far from one of the buildings. In all the commotion no one had noticed as he and the native boy had slipped away, the boy on Robson’s horse. Robson had by this time joined the men of “B” Company, who had also received the warning and were now frantically building up walls of mealie bags, connecting the two buildings. Robson took a place in front of the storehouse where the perimeter met a stronger built cattle kraal. From here he had a clear field of fire across to where the wagon was parked. The front wall and stone kraal was to come under fierce attack during the evening as the Zulus launched repeated charges at the walls. For some 12 hours this relentless assault continued until on the morning of 23 January and with the defenders’ ammunition down to the last 20 rounds each, the Zulus retired. They left 350 dead bodies scattered around the area, but many more were discovered in the weeks to come, hidden under rocks and in caves on the hills above the station. The defenders suffered only 17 killed and eight seriously wounded. As the weary men cautiously went around, collecting weapons and repairing defences, Chard inspected the wreckage of his wagon, discovering an unbroken bottle of beer, which he shared with Lieutenant Bromhead - Robson’s efforts had not been entirely wasted! Chard and Robson remained at Rorke’s Drift for several weeks to work on a more permanent fortification of the garrison. On 4 July 1879, they were both present in the British square at the battle of Ulundi for the final defeat of the Zulus. Following the cessation of hostilities, 5th Company moved to St Paul’s Mission, where they were occupied in building another fortified position. They embarked aboard the S.S. Eagle, arriving at Portsmouth on 2 October, where they were greeted as heroes by a whole host of generals including the Commander-in-Chief, H.R.H. The Duke of Cambridge. Chard and his family were then taken by carriage through the streets of Taunton, to the strains of “Hail the Conquering Hero Comes”, and on to the village of North Curry where a large and elaborate party had been planned. In one of the many speeches made later that day, Chard said he was sorry that [Lieutenant] Bromhead and [Surgeon] Reynolds were not with him to see how much was thought of what they had done at Rorke’s Drift, but he was glad to say that there was one other besides himself (referring to Robson, who was occupying a box seat of the carriage) who had the opportunity to see how greatly their services were appreciated, and what a splendid reception had been accorded them. General Sir Percy Douglas, Chelmsford’s predecessor in command of the forces in South Africa, then stood up and called for three cheers for the “Noble Sapper on the Box”. The tour continued to Plymouth, London and Chatham. On 10 October Chard and Robson went to Balmoral for an audience with Queen Victoria. For Robson, though, the share of Chard’s glory was all too brief, for in November he left Chard in Somerset to return to the more normal army existence, taking with him the hand written testimonial from his former master listed above. In February 1880, nearing the end of his six years’ service with the colours, Robson was transferred to the 7th Field Company at Chatham, but when the 7th Company left for Natal in 1881, he decided not to re-engage and was transferred to 11th Field Company, to be discharged a month later on 20 June. However, in September 1881, he began a new job at Chatham barracks as a civilian groom and general servant to Captain C. H. Gordon, R.E., and accompanied this officer to Cork, but when Gordon returned to Chatham in July 1882 they parted company. He was re-called to the colours on 2 August 1882, and posted to Aldershot as batman to Lieutenant Maude. He received two pence good conduct pay from that date, and on 13 November 1882, he re-engaged to serve a further twelve years. He received his final discharge on 30 April 1894. Charles Robson died on 19 July 1933, at St Nicholas Hospital in Plumstead. He was 78, and was buried in an unmarked grave in Plumstead Old Cemetery. A hand-carved wooden marker plaque was placed at the grave site on 22 January 1993, and in 1999 a more permanent memorial plaque was placed at the grave by the Royal Engineers Association. From the Spink Circular, November 1974. SAGS (1) 1877-8-9 (Pte C Mason, 2-24th Foot). Enlisted at Brecon, 2nd March, 1877. To Regiment 31st March. Left England with the 2/24th Bn. for South Africa, Feb, 1878. After the war the Bn. left for Gibraltar. 13th Jan., 1880 until 11th August, 1880. They were then ordered to India until 21st Jan., 1886. Medal roll confirms award and dated bar 1877-8-9. Pte. C. Mason is confirmed as being present at the Defence of Rorke's Drift by Lieut. Chard and Col. Sgt. Barrie. Provenance: The Kuriheka Collection, Dix Noonan Webb, June 2006. “I was glad to seize an opportunity to wash my face in a muddy puddle, in company with Private Bush (sic) 24th, whose face was covered with blood from a wound on the nose caused by a bullet which had passed through and killed Private Cole 24th. With the politeness of a soldier, he lent me his towel, or, rather, a very dirty half of one, before using it himself, and I was very glad to accept it. Appointed Lance-Corporal shortly afterwards, on 10th February, Bushe left the Cape in January 1880, to spend seven months serving in the Mediterranean before moving to India as a recently appointed Lance-Sergeant in August 1880. He re-engaged at Secunderabad in December 1880, to complete 21 years service, and reverted to Private at his own request in October 1881. Appointed Lance-Corporal once more, he went to Burma in May 1886, where he served until November 1888, earning the I.G.S. medal with clasp ‘Burma 1887-89’ as a Corporal, to which rank he had been promoted in April 1887. After a further two and a half years in India, Bushe returned to the U.K. in May 1891, where he was discharged on 10 October 1891. Sold with copied discharge papers. 24th Foot casualties at Rorke’s Drift amounted to 4 killed or died of wounds and 2 wounded in the 1st Battalion; 9 killed or died of wounds and 8 wounded in the 2nd Battalion - a total of 13 killed and 10 wounded. 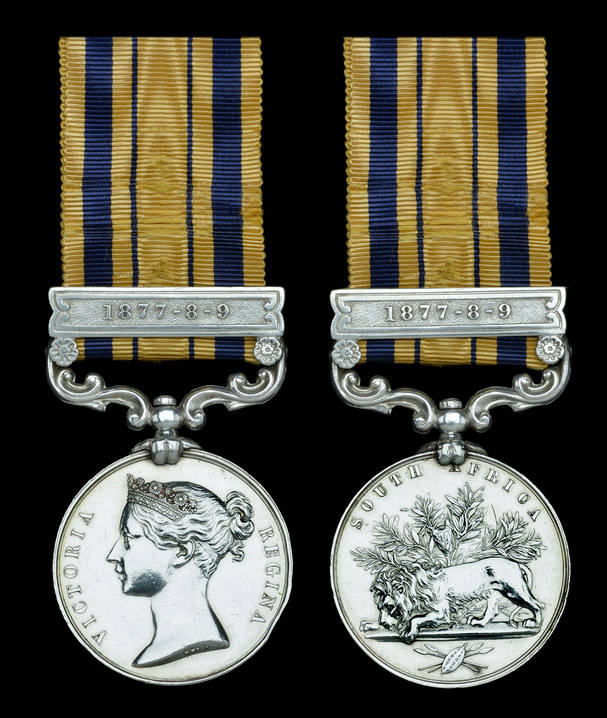 South Africa Medal 1877-79, clasp 1877-78-79 engraved, in large upright capitals. EF once cleaned, extremely rare. Born St. Patrick's, Dublin, CO Dublin; Trade -None, Attested at Bow Street Police Court, London, on 23/2/77, aged 24 years. Description 5'9” tall, fresh complexion, gray eyes, brown hair. Served in South Africa, Gibraltar, and India. Confined on 24/4/78, convicted of disgraceful conduct 'In losing a pair of boots' and imprisoned on 27/4/78. Released 29/7/78. Served in “B” Company at the Defence of Rorke's Drift. Served in South Wales Borderers from 01/7/81 but did not transfer to regiment. Transferred to Army Reserve on 21/6/83 discharged on 25/2/89. 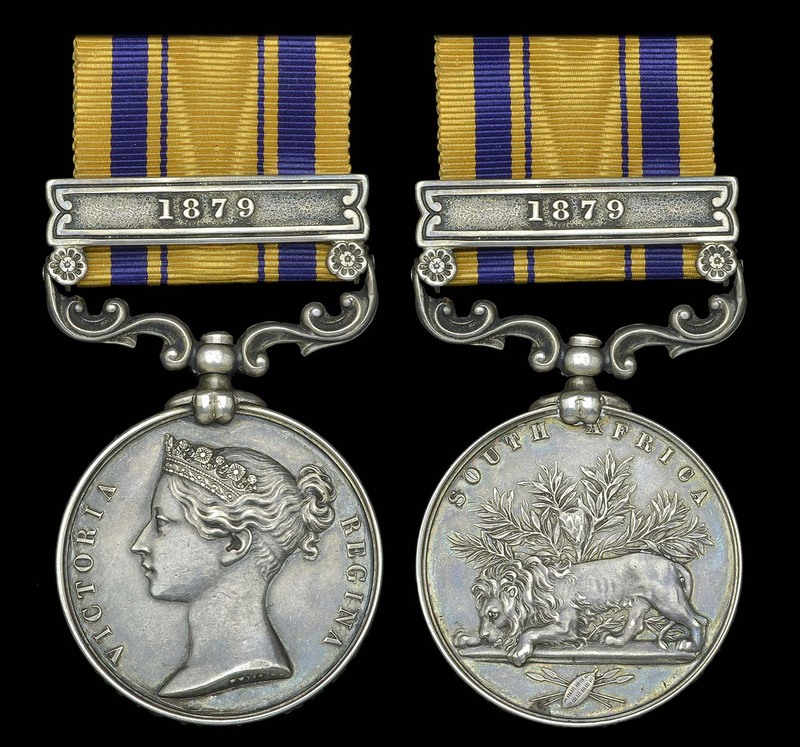 Medal for South Africa with clasp '1877-8-9'. Robinson is confirmed on Chard's Roll, Bourne' Roll and The Dunbar List. Medal went Unsold – At that time anything unsold from the auction could be bought for the reserve. The Pound was worth $1.99 Canadian in 1993 so therefore it would have been worth 6,700 Pounds. Happy days Mike, good to reflect and remember a world without awful hedge fund managers, just collectors and a well defined interest. The medal to Bushe just sold for a hammer price of £60,000.